In "Building An Electric Car", Morris Rosenthal writes: "The Model T became the killer app of the automotive world with 20 horsepower engine and a 1200 pound curb weight, and it likewise showed its worth for over a decade. The world may have changed quite a bit between now and then, but I have to believe if people could buy street legal Model T’s to tool around the country for $850 (their introductory price), there would still be a market." Believe me, if they were still available for $850, I would be using a Model T for most of my transportation needs, right now! Think about all of the golf carts and UTVs people use now for neighborhood travel, traveling between the buildings of large businesses, etc. The UTVs are designed for offroad use, but that's not how most of them are used. Besides, the Model T was designed for dirt roads, because that is all there was in its heyday, in most places. I am convinced that there would be a huge market for them in today's world, even if they were $10,000. That would put them out of my price range, but they would sell extremely well. I can see them being sold at the places that sell motorcycles and ATVs. Perhaps also at farm stores, like Tractor Supply and the co-op. It could be done, too. I'm pretty sure the frames and all body panels are still made, and an industrial type diesel or gasoline motor, coupled with a UTV transaxle, could replace the original-type drivetrain. The Model T drivetrain was actially not much different in function from a modern UTV anyway. 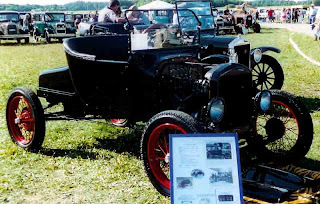 "The Model T was a rear-wheel drive vehicle. Its transmission was a planetary gear type billed as "three speed". In today's terms it would be considered a two speed, because one of the three speeds was actually reverse. The middle pedal was used to engage reverse gear, and the right pedal operated the engine brake. The floor lever also controlled the parking brake, which was activated by pulling the lever all the way back. This doubled as an emergency brake." As you can see, this is much more similar to a UTV than to a modern car.